Anyone who wants the best for his clients must set the standards again and again. 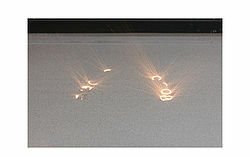 The new high-tech fabrication center which BEGO has just erected at its headquarters is an example of this: this is where we fabricate your frameworks using up-to-date laser and milling techniques currently employing four different procedures. It is also environmentally-friendly: The new production plant was built as a “Green Building” and consumes 25 percent less energy than demanded by the EU standard. This procedure, developed and patented by BEGO, offers unequalled quality when fabricating metal frameworks. Your CAD data is used to control the laser which melts metallic powder layer-by-layer to build up the framework. 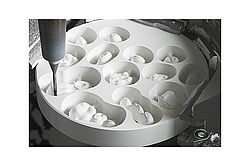 High speed cutting is the procedure of choice for precise fabrication of zirconia frameworks. Implant prosthetics made of titanium and Wirobond® MI+ can also be fabricated with this procedure. 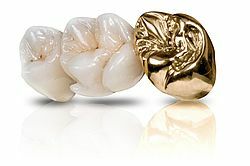 The CAD Cast procedure gives you access to a wide range of precious alloys. 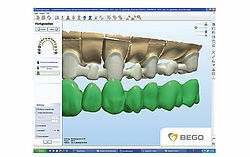 Acryl frameworks are fabricated in the BEGO Medical center, based on your CAD models or files. Rapid Prototyping is used to fabricate frameworks from fully residue free acrylic resin into restorations for overpressing with ceramic or for CoCr partial dentures.